Interested in saving up to 25% on your invoice discounting charges? 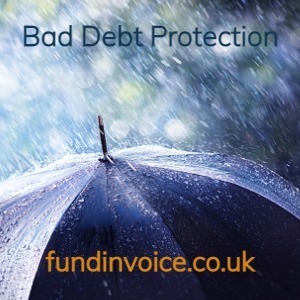 Some factoring companies will actually lower the service charge element of a factoring quote if you agree to take bad debt protection, as an optional extra. A few well known providers recently quoted for a potential client and told us that they would be able to reduce the administration charge (often referred to as service charge, despite that term being more appropriate for factoring facilities) by between 20 and 25% if the prospect agreed to take out bad debt protection, also called "non recourse", rather than a recourse facility (where the risk associated with debtors failing is carried by the seller). So by adding non recourse with the right provider, you may be able to unlock such a saving. It is common for providers to quote fees as a service charge percentage of invoices discounted and an additional premium, often called the "credit protection element" of CPE if you choose to add non recourse. This is not always the case, some providers do not dissect their fees in this way. Amongst those that do, in recent quotes they a few have indicated that they will reduce the service charge element (excluding the CPE) by up to 25% if the prospect adopts non recourse as opposed to recourse. The CPE quote is likely to vary between providers but it is often a standard additional charge that a particular provider makes for the credit protection. Protected invoice discounting, or PID, puts all parties in a more secure position. The customer knows that if a debtor becomes insolvent, and they trade within a pre-agreed credit limit for each debtor, they will not suffer a bad debt. There can be some additional terms involved, such as first loss clauses (which are similar to having an excess on an insurance policy), and not all providers offer 100% bad debt protection in the first place (in some cases it can be say 90%). But despite these kinds of limitations, losses through bad debts can be largely mitigated by taking up these options. This protection can also improve the providers perception of the risk associated with funding a sale ledger, especially when the bad debt protection is backed by an external credit insurance policy. This may be what is driving their ability to discount the service charge in some cases.